Dedicated white-light solar telescope for the observer on the go. The 50mm refracting telescope uses Celestron's Solar Safe, ISO compliant, full-aperture glass filter material to ensure the safest view of solar events. 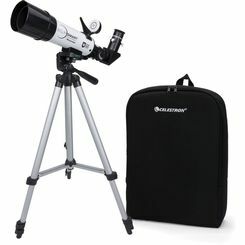 The kit comes complete with everything you need, including the dedicated solar telescope, a Solar Safe finderscope, tripod, a high quality 20mm (18x) Kellner eyepiece and a nylon backpack to carry everything in.